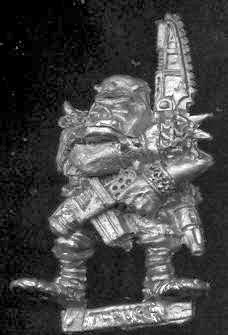 Appearing in The Battle for the Farm, an introductory scenario for Rogue Trader, Thrugg Bullneck led the ork forces against the Crimson Fists – all in the noble name of honour and glory getting his buried loot back from those beekees! Excellent work on recreating a classic model in the current size standard! The paint job looks great, very gritty. I love the pet squig and the way it's reaching its head up like a dog would! The only thing I would have done differently is I would have used a chain weapon for the choppa, but that's just me. And.....it's been looted. Nice job and a bit of nostalgia for us beardy old rascals. Nice job of re-creating the level of detail on those old sculpts, good flesh tones too - is that purple in the recesses? Very nice take on a classic! Agree with everything said so far! Love the concept and execution. Like Peredyne, I might have preferred a chain weapon, but the current choppa is still cool. Nice work! Great build and paint job! Is the squig made from green stuff? could use a chain choppa, still proppa! "In Armageddon, foist ya gets da teef, den ya gets da dakka, and DEN ya gets da custom mega-blasta." Love it. I'm a fan of Warbosses with plenty of character. I'm actually a fan of the static bladed chopper, I just think it could be a tiny bit bigger. I think it needs a Crimson Fist helmet somewhere. What parts were used in this conversion, by the way?